[AUTO]:When retired from (GC), you may Soul Charge (1). 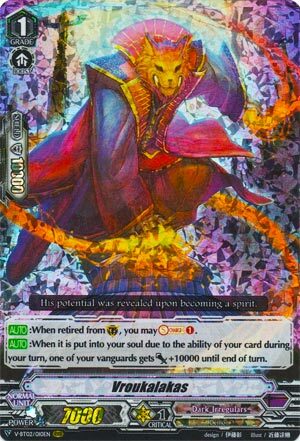 [AUTO]:When it is put into your soul due to the ability of your card during your turn, one of your vanguards gets [Power]+10000 until end of turn. So, it’s not exactly the BEST booster, but it hardly matters when none of this card’s skills are good on RG circle and you shouldn’t be starving for boosters with this deck. You get a free soul when used to defend, and should he be absorbed into the soul, you’re looking at a pretty meaty Demon Eater or Death Anchor swinging at the opponent (not especially difficult when you’re consciously choosing to throw this into the soul either from field or hand). Friday’s card is what makes tis card really tick though. Even without though this is solid.